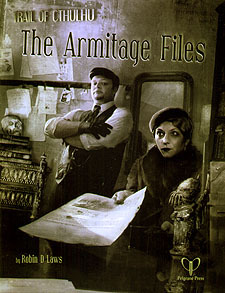 The Armitage Files presents a boldly innovative way to generate blood-chilling adventures for your Trail of Cthulhu investigators. Players seize on clues presented in the ten mysterious documents. They choose which leads to track down. The Keeper, using clearly broken down step-by-step techniques introduced in this volume, improvises suitably mind-blasting mysteries in response to their choices. Weave these together into an epic campaign of madness, dread and danger. Mystery takes on written form when pages from a disturbing manuscript fall into the investigators' hands. Can your mind correlate the awful beauty of 10 stunningly distressed handouts realized by acclaimed illustrator Sarah Wroot? A series of scrawled messages, comprising a free-floating cacophony of facts, speculations, and fevered imaginings, portends cryptic doom. Preliminary inquiries reveal that they are written in the hand of Dr Henry Armitage, director emeritus of the Miskatonic University Library. Combine the documents with pre-prepared elements such as supporting characters (in sinister, heroic or in between versions), organizations, locations and artifacts to create your unique version of the Armitage Files.